We test the best for $250, pitting the new Ryzen 5 1600X against Intel's vaunted Core i5-7600K. 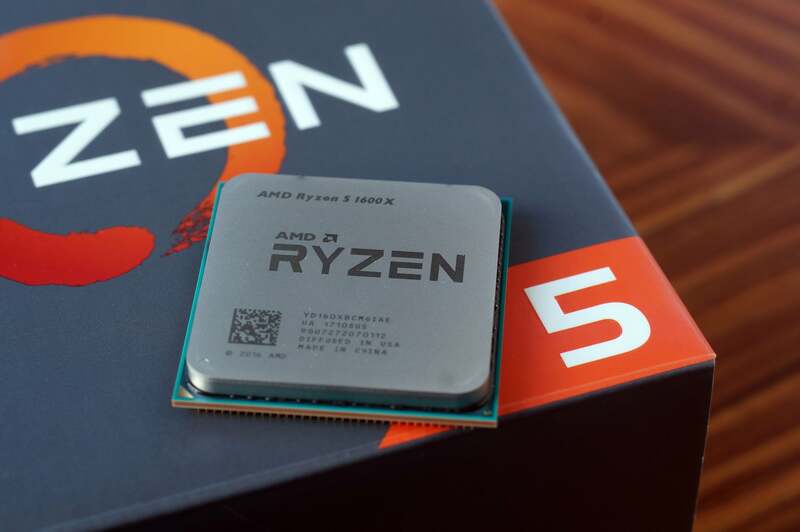 AMD’s $250 Ryzen 5 1600X is here to challenge Intel’s quad-core, $250 Core i5-7600K for the honor of being “The People’s CPU.” Everyone likes to read about expensive, gold-plated, $1,000 parts, but in the real world, most people can’t or won’t spend that much and are looking for the best price-to-performance ratio. While Ryzen 5 1600X may not have clock speeds as high as the Core i5-7600K’s, it does offer additional cores and virtual cores. We’ve run a battery of benchmarks to see if those cores will make up the difference. AMD’s Ryzen 5 1600X will compete head-on with Intel’s Core 5-7600K in the all-important $250 CPU category. AMD actually announced four Ryzen 5 CPUs last month. 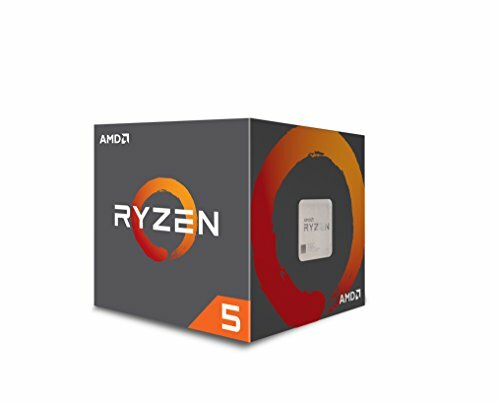 Two of them are quad-cores with SMT (simultaneous multithreading): The $169 Ryzen 5 1400 and the $189 Ryzen 5 1500X. The last two are six-core chips with SMT: The $219 Ryzen 5 1600 and the $249 Ryzen 5 1600X. All are based on the same die used in the upscale Ryzen 7 lineup we’ve already reviewed, but they have cores switched off. 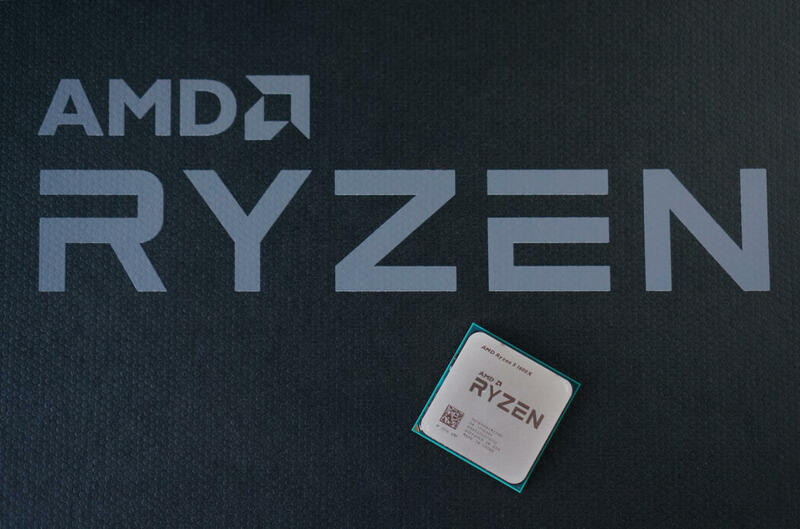 The one of most interest to us is the Ryzen 5 1600X. 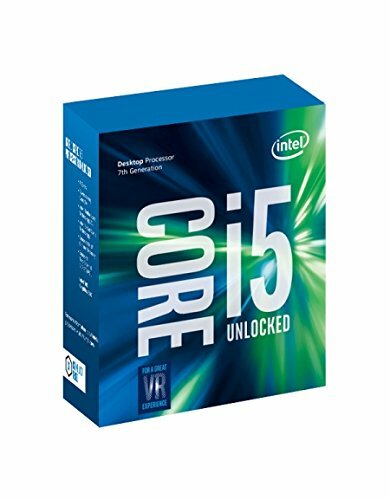 With its list price of $249, it maps almost perfectly to the Core i5-7600K, which has a current list price of $242 and has sat around at $250 for much of its life. 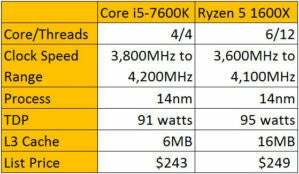 The six-core and quad-core Ryzen CPUs are essentially built using the same eight-core dies from Ryzen 7. Each features two Core Complex (CCX) units with CPU cores switched off. One core on each is switched off for the six-core Ryzen 5s, and two cores on each are turned off for the quad-core CPUs. They also have different clock speeds. Each Zen core complex is made up of four individual processors. AMD turns off some cores for the six-core and quad-core Ryzen 5 parts. For the Core i5-7600K, testing was conducted using the same system we used for the Core i7-7700K in our Ryzen 7 review, but with a few key changes. We updated the Asus ROG Maximus IV Code to the latest available BIOS, which basically adds Optane support. We also pulled two of four memory modules we had installed. This reduced the RAM from 32GB to 16GB of DDR4, but it also allowed us to increase the memory clock of our Corsair modules from DDR4/2133 to DDR4/2933 speeds. Note that running Kaby Lake at higher speeds with all memory slots full isn’t an issue. Not all of the CPUs we tested (*cough* Ryzen), however, will easily support high clock speeds with all DIMM slots loaded. For the Ryzen 5 1600X, rather than re-use the previous AMD X370 build from the Ryzen 7 review, I used an MSI B350 Tomahawk motherboard. AMD provided the board, saying it had a newer BIOS that offered the best performance. A clean install of Windows 10 was loaded onto a Kingston 256GB HyperX SSD (the same model and capacity used in other test machines). For RAM, I used a pair of Geil EVO 8GB modules with the timing set to AMD’s specifications for testing on the Tomahawk board. As with all of our builds, we used Founders Edition GeForce GTX 1080 cards. I verified clock and RAM timings on each card before I began testing. Read on for productivity benchmarks on Ryzen 5.